With 26 vitamins & minerals, 3 g of fiber and 10 g of high-quality protein in each 8 fl oz bottle, BOOST® ORIGINAL Drink provides the kind of nutrition you need. Be up for anything! Enjoy this great-tasting nutritional drink as a mini-meal or between-meal snack. 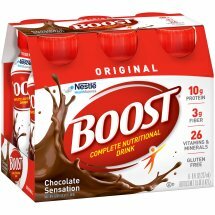 BOOST® ORIGINAL Drink comes in 3 great-tasting flavors—Chocolate Sensation, Vanilla Delight, and Strawberry Bliss.